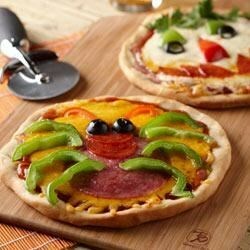 "Set out your favorite pizza toppings and let everybody create their own spooky or fun masterpiece!" Bake for 6 to 7 minutes, dough will be just set and only lightly browned on the bottom. Remove crusts to a wire rack to cool. Continue with remaining pizza dough. (Works best to use several baking sheets.) May use crusts immediately or place in freezer bags and freeze for up to 1 month. When ready to bake, preheat oven to 475 degrees F. Spread each crust with pizza sauce. Top with desired toppings to make Halloween designs! Repeat with remaining pizzas. Place on a baking sheet and bake for 6 to 8 minutes, until cheese is melted and lightly browned and bottom of crust is browned. I didn't hate this dough, but I much prefer the whole wheat agave version that I usually make. This was very easy though and fun to make the little pizzas. Made these with the granddaughter, quick and easy to make. We had a blast decorating them. Definitely will make again. fabulous crust, and very cute topping ideas. I love how you prebake these and can freeze for later. I froze them and then we used these on the grill. Perfect! SO easy and the flavor is great! I loved making 8 personal pizza doughs but freezing half for later. I will definitely use this recipe again and again.